It may be the weekend but there are 2 more new slots to enjoy – they come in the form of Lucky Stripes and Casino Charms. iSoftBet takes you to Las Vegas with Lucky Stripes, a 3 reel slot with only 1 paylines. Playable from only 1p per spin on all devices, the aim is to form winning combinations of 3 symbols – if you land 3 stripes with the same colour on the middle reel, you will get a win of up to 100 times your stake (for the Gold Line). There’s a Rockin’ Respins feature which is played when you get a wild on reels 1 and 3 as well as the Rockin’ Respins logo on the middle reel – the 2 outer reels (with the wilds) lock in place with the middle reel respinning. Every win can give you 100 times your stake – the respins only end when you see a collect symbol appear. Read the Lucky Stripes slot review for more info. Playtech also takes to you to Sin City with Casino Charms played on an unusual 6 reel, 80 payline machine. Playable on all devices from 20p per spin, you join croupier Roxy on the reels where you’ll see classic symbols like bars, poker hands, casino chips, 7s, die and diamonds. There’s a Roxy Respins feature where you get respins with held Roxy and wild symbols. It’s all about the Casino Charms Bonus & Free Games feature where you spin the bonus wheel to get up to 25 free spins, up to 15 free spins with 2 wild reels or access to the Mega Respins feature where you’ll play 8 respins. With 800 times your stake to be won on each spin, make sure you check out the Casino Charms slot review. 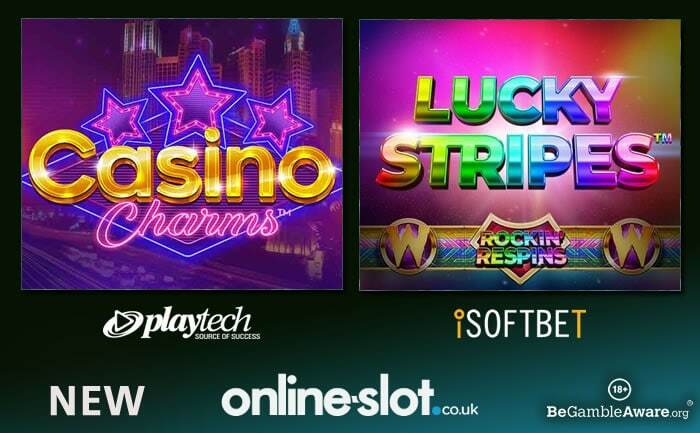 There’s never a shortage of new slots added at Online-Slot.co.uk – over the last few days, iSoftBet’s Piñata Fiesta, Playson’s Mega Burning Wins: 27 Ways and Blueprint Gaming’s Celtic Football Club have all been released. Visit the New Slots section for the latest games.